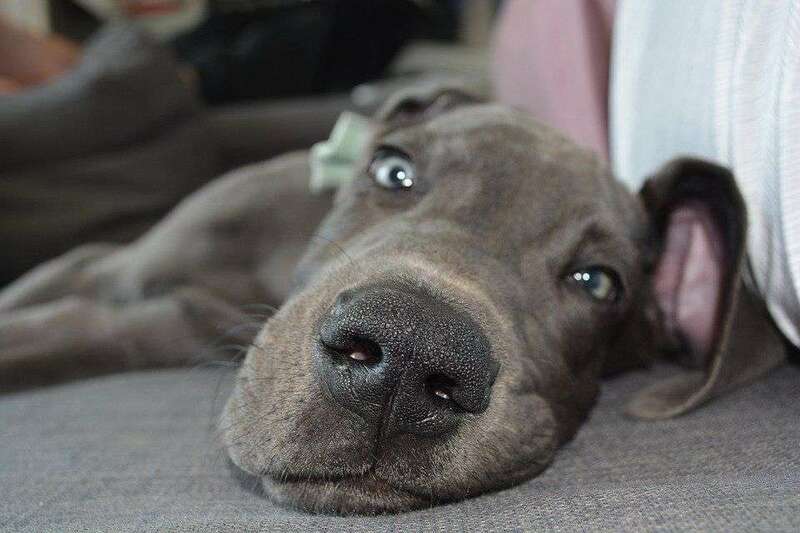 Ah, the lovable goofy Great Dane! Apollo of the dogs, with an affinity for destruction. A good old tennis ball might do the trick, but if you’re looking for something that will last for more than one play session, check out our recommendations of the best Great Dane toys which work wonders with our resident Danes. All of our toys have been tried and tested by us – but if you have other suggestions please let us know in the comments section below or via our facebook page. These foam rings might not seem like the economical option, but they have many uses to be worth their price. The pack consists of two rings, and some initial ideas on how to use the rings. Danes are not known for their retrieving abilities, but we managed to successfully teach ours to fetch one ring, return it for a quick game of tug, while we throw the other one for the next run. 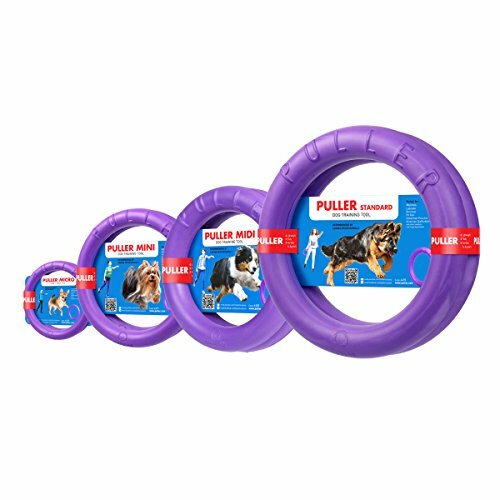 Spend 5 minutes with the Puller rings and both you and your dog will be in love. 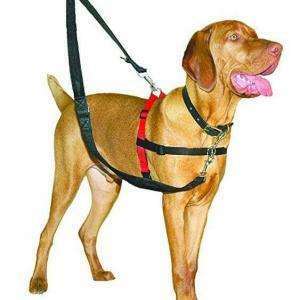 You can also use one for a quick game of tug around the house, and they are invaluable for redirection during your puppy’s biting phase. Another of our best Great Dane toys from the ever-reliable Kong brand is the Wobbler, a treat and food dispensing toy. 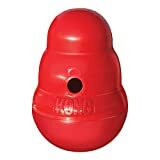 The Wobbler is the same unique shape as the Classic, but it sits upright and has a small hole for kibble on the side, instead of the usual one at the large end, like on the Kong Classic. The top part screws off for easy filling, and the bottom part is filled with sand and allows it to… wobble around. Another big difference is that it is made out of plastic, rather than the rubber material like a lot of the other Kong toys. The premise and the name sound strange at first, but it is a great toy in many ways. 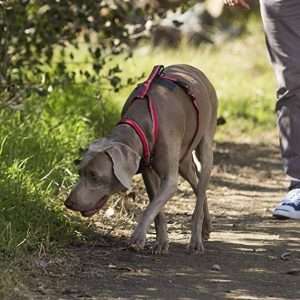 From a health point of view, if you’re worried about bloat and you want to make sure your Dane isn’t just swallowing large amounts of kibble at once, the Wobbler will considerably slow and extend mealtimes. 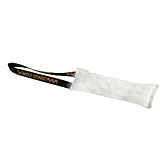 It also provides a great mental and nose exercise, which should be calming for your dog. 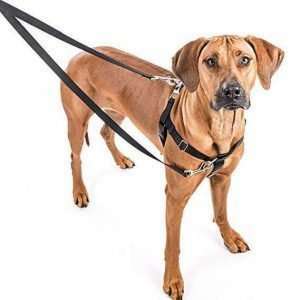 Like other Kong toys, this could be something to leave with your dog if you have to pop out for a short period of time. As it’s made of plastic, it is best not to leave your dog unattended while using the Wobbler though, especially if your dog is a chewer. One of our Great Danes is very determined to always get what she wants and does not give up easily, she absolutely loves the Wobbler and will often ask for it. Her technique is to try anything until the food comes out. Our other Great Dane loves it too, however, if it goes into a corner, he gives up without trying anything other than pushing it with his nose. Some dogs take a while to figure out how to get the food out, but that half the fun. If you want to help them at any point, you can always join them in the food hunt, provided they don’t have an issue with you being around their food. We don’t want to make Great Dane toys sound complex. 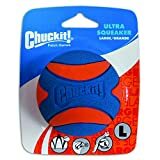 Most dogs love just a simple plain tennis ball, but if you’re looking for something with a bit more oomph, look no further than the Chuck It Ultra Squeaker ball. The rubbery material of these balls makes it irresistible, and the squeaker intensifies the desire to get the ball. 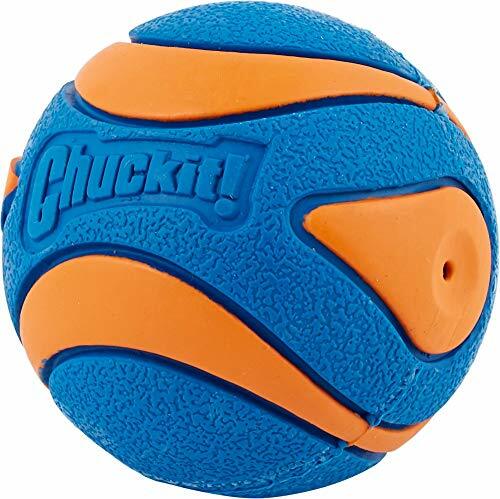 This ball worked wonders in teaching our Great Dane to wait, speak and be quiet when asked. Best ball ever! And perfect for the beach. Your Great Dane is not keen on our choice of top toys? Dingo leather tug will solve your problems! This sturdy toy made out of suede leather will be a hit with any dog who prefers soft toys. 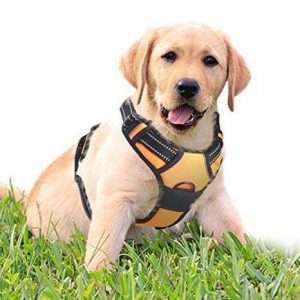 It works as a retrieving dummy as well, or with a bit of scent, you can try something calmer like scent work. Kong is a well-known name among dog lovers, and this massive Classic is the perfect size for your giant. 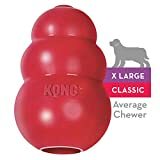 A popular staple of the Great Dane toys market -Kong Classic provides great mental stimulation and can work a treat for you need to leave your beloved pooch alone at home. Our favourite recipe is xylitol-free peanut butter, sprats and a drizzle of honey. We hope you enjoyed our article on the best Great Dane toys. Given their strength and energy, it is always best to find toys which are not only entertaining but robust. We’re particularly big fans of the Kong range as well as the PULLER. These toys have served our Danes well over the years from puppy to adult. If you have any more suggestions on the best great Dane toys out there – drop a comment below or reach out on our Facebook page.